Getting tired of the outstanding Tim McGraw reviews? Then go read about Emotional Traffic. Fact is, Everywhere-era McGraw was as close to perfection as radio-friendly country music gets. 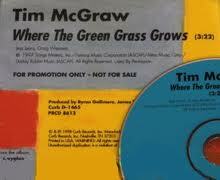 “Where the Green Grass Grows” is tightly produced, with an instantly recognizable opening fiddle. The urban burdens and backporch fantasies aren’t just cleverly constructed. They’re also brilliantly contrasted. My personal favorite? Comparing the idyllic corn popping up in rows to the “supper from a sack – 99 cent heart attack.” But the entire song is chock full of imagery like that, funny and poignant and a little sad. All the stuff that great country music is supposed to be. Fact is, Everywhere-era McGraw was as close to perfection as radio-friendly country music gets. I have loved this song forever. Even more so as I got to where I could understand the lyrics more fully. I love how that unshakable fiddle hook just makes the song feel so easily accessible. Love this song. Early McGraw really was flawless. Sad I can’t stand 90% of what he has released this decade.